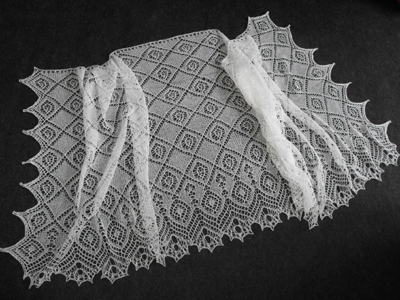 The very delicate but eye-catching stole *Verena* is suitable even for novices in lace knitting. The shape is rectangular, starting at the long side. The lacy points at the narrow sides are shaped by increases and decreases at the beginning and end of each patterned row. Note: This pattern has been published in the German magazine "Verena Stricken Sommer 2010". It has also been published in English "Verena Knitting Summer 2010“ and French "Burda Tricot No. 11, été 2010“.